Keep the volume of your T.V., music system low. Honk the car horn sparingly. Avoid the use of band, crackers in wedding processions. Get all to practise laws regarding Sound pollution. Keep smoke emission from homes, factories, vehicles to minimum. Dispose garbage in bins, do not bum it. Use spittoons or flowing drains for spitting. Get all to practise laws regarding Air pollution. Never dump garbage near communal taps, wells and other water bodies. Do not tinker with public water pipes. Immerse holy idols in authorised places. Get all to practise laws regarding Water pollution. Prefer organic manure to chemical fertilizers, paper to polythene, cotton, jute to polyester. Dispose polythene bags through proper channel. Plant more trees and vegetation. Get all to practise laws regarding Chemical pollution. We all know that we're supposed to reduce, reuse, and recycle, but what exactly does that mean? It’s not just putting your soda bottles out every week and using grocery bags as lunch bags. Here are some other ideas that are easy enough for you to do and encourage others to do as well. Reuse bags and containers. Brown paper bags are great for wrapping packages. Wash out plastic containers and glass jars you buy food in and use them as Tupperware. Use old newspapers as wrapping paper and jazz it up with pretty ribbon or a bow. If you’re lucky you might get Sunday’s color comic section. Instead of throwing them out, donate clothes and toys to a local shelter or second hand store. Organize an in-home recycling center and teach your family how to use it. Have separate bins for glass, plastics, and newspaper/cardboard. Make a deal with your family that if they put their recyclables in the bins, you’ll take them to the curb. Additionally, create a bin for e-waste (old cell phones, mp3 players, etc.). Instead of dropping these items at the curb, take them to any e-waste program. Be fancy! Replace the use of paper napkins at dinnertime with cloth napkins. You can wash these a few times a week or whenever they're dirty. Use dish towels to wipe up messes instead of paper towels. This too will help cut down on the amount of garbage your household produces. Choose paper over plastic for your party. Having people over and want to use disposable plates and cups? Skip the plastic and get paper ones. These break down easier in the environment and don’t deplete the ozone layer as much (although it’s better to nix the disposables and use washables!). Ask the dry cleaners if they will take back their wire hangers and use them again. Or even keep them for yourself and put them to good use. Grocery Store Cashier: "Paper or plastic?" You: "Neither!" When grocery shopping, take your own reusable canvas or cloth bags (or ask your parents to). See which colleges got top marks from Grist, then grade our effort in the comments section at the bottom of this page. This small school in Bar Harbor, Maine, has just one major: human ecology — or “the study of our relationship with our environment.” So it only makes sense that it was the first college in the U.S. to pledge carbon neutrality. And it kicked off quite a trend: Now more than 270 other U.S. colleges and universities — including many of the following — have pledged to do the same as part of the American College & University Presidents Climate Commitment. This Vermont college is a hotbed of climate activism. Student group MiddShift pushed the board of trustees to approve a plan to make the school carbon-neutral by 2016. Students have also led the charge to host energy-saving contests in residence halls, increase use of public transportation to and from campus, and turn down campus thermostats. A handful of students and recent alums, along with scholar-in-residence Bill McKibben, helped organize the Step It Up 2007 campaign demanding action to fight climate change, and now a Middlebury delegation has joined up with the Climate Summer campaign in New Hampshire. This appropriately monikered university in Costa Rica is dedicated to promoting sustainable development in the tropics. Students from more than 20 different countries go through a four-year program to earn an agronomy degree as they learn to balance ecological preservation and agriculture. 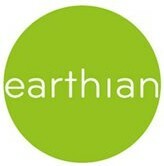 EARTH University’s “rational use of resources” program aims to instill an eco-ethic in everyone on campus. True to its roots — and its name — this Washington state school maintains a strong commitment to sustainability: An organic farm, almost an acre in size, produces enough food to have leftovers after selling to the campus food service, and proceeds go into financing farm projects and other student endeavors. A massive composting program is also in place — complete with a compost reactor, worm bins, and food-scrap collection at residence halls. And after students voted to approve a fee increase, the school was able to purchase 100 percent (ever)green power. Hoping to get an ober-view of energy use, faculty and students at this small liberal arts college in Oberlin, Ohio, collaborated in 2005 to create a web-based monitoring system in some of the dorms that shows how much energy and water is being used, giving students real-time feedback that can help change their consumption habits. Last year, students worked with Cleveland-based CityWheels to create a car-sharing program on campus. The college’s Adam Joseph Lewis Center for Environmental Studies is housed in a pioneering green building that opened in 2000. Oberlin also boasts Ohio’s largest solar array and is transitioning to 100 percent earth-friendly cleaning products. This Ivy Leaguer began a Green Campus Initiative in 2000 and has continued to grow its green roots [PDF] since then. Harvard has made major investments in energy conservation in campus buildings, introduced a green cleaning service, and integrated local and organic produce into school cafeterias. Plus, 20 new-construction and renovation projects have been certified for green credits since 2002, more than at any other university in the country. The Crimson’s green tide is also extending to transportation, with biodiesel being made from kitchen oil and used in university buses. A leader in the greening of Canadian campuses, UBC adopted a sustainable development policy in 1997 and a year later opened a campus Sustainability Office — both firsts for the nation’s colleges. Offering more than 300 sustainability-related courses, this Vancouver campus was Canada’s first and only university to receive Campus Ecology Recognition from the U.S.-based National Wildlife Federation, in 2003 and again in 2005. And just last year, UBC developed a comprehensive sustainability strategy to keep the eco-momentum moving. This year, Chico State won grand prize in the National Wildlife Federation’s Chill Out competition, which challenges colleges to find effective ways to fight global warming. Chico State’s dedication to sustainability also includes LEED-certified buildings and solar arrays atop some campus rooftops, and students have taken up the charge with energy-saving projects and sustainability-minded service-learning programs. Tufts is getting tough on climate change. It has committed to meeting or exceeding the Kyoto target for emissions reductions, and it was the first university to join the Chicago Climate Exchange. The Tufts Climate Initiative won the U.S. EPA Climate Protection Award in 2005. The university has a strong history of incorporating sustainability throughout its operations and campuses. The U.K.’s second-largest university, Leeds is a leader in eco-friendly waste management, and the school’s work in that area has won it a Green Gown Award [PDF] from U.K.-based HEEPI (Higher Education – Environmental Performance Improvement). By replacing trash bins with recycling containers, it doubled the amount of recycling happening on campus. The school has also changed its purchasing practices to favor recycled goods. Calling itself “Vermont’s environmental liberal arts college,” GMC uses the environment as a central theme in its core curriculum. Also central to its operation? Methane from nearby dairy farms that provides half of the school’s electricity. Additionally, GMC’s efforts to save energy helped earn it the first Energy Star Showcase Campus award from the U.S. EPA in 1999. Yale President Richard Levin wants to make his school the greenest in the U.S. The university has committed to reducing greenhouse-gas emissions to 10 percent below 1990 levels by the year 2020. (Hello, DIY Kyoto.) To reach its goal, it plans to tap into renewable sources of energy, purchase carbon offsets, make its energy systems more efficient, and build new buildings greenly. Taking the commitment even further, the university hopes to aid China in reducing greenhouse-gas emissions and educating its leaders on environmental issues. When it comes to sustainability, this Grand Rapids, Mich., school gets right down to business. Literally. Aquinas bills itself as the first college to offer an undergraduate major in sustainable business — a four-year curriculum that combines formal biz training with environmental studies. Growing interest in green biz led to the creation of the Center for Sustainability, an online resource center. The first Scottish university to get energy-efficiency accreditation (in 1998), Glasgow draws almost 45 percent of its electricity from renewable sources and is constantly on the lookout for new ways to reduce overall energy use. Recognized by HEEPI for its sustainable procurement practices [PDF], the school has ensured that construction of new buildings involves energy assessments and energy-saving designs. Students at this College Park campus recently sent a loud-and-clear message about sustainability: some 91 percent of undergrads voted to raise student fees in order to pay for clean energy, when tuition and fees are already at record highs. If implemented, the fee increase would eventually raise enough money to make UM the largest higher-ed purchaser of renewable energy in the U.S. UM — one of the many schools committed to going carbon neutral — is also doing what it can to reduce energy use: a combined heat-and-power plant completed in 2003 received the U.S. EPA’s Energy Star award, and motion sensors that automatically shut down unused office equipment are currently undergoing testing. 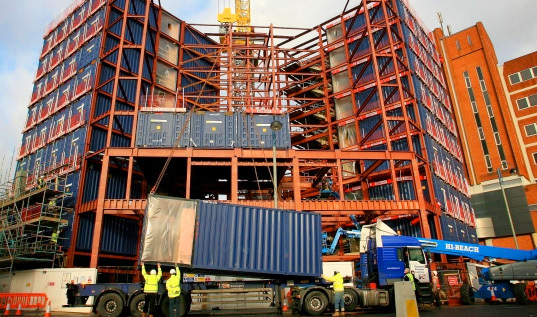 Travelodge lands in the top 5 for its Uxbridge outpost, built from 86 different shipping containers by Verbus Systems. While the rooms and exterior cladding may make this look like any other motel, the modular construction process by which it was built saved considerable time, money, and materials – so much so that the savvy global motelier is planning to erect a 307-room version at Heathrow for a savings of up to 10 million pounds ($18.6 million). Once it’s built, the Heathrow shipping container motel will make the perfect first night’s stop for a green traveler on the move. Once in Europe, the cozy De Vrouwe van Stavoren Hotel in the Netherlands is a must-see for the green traveler. These giant 14,500 liter casks once flavored thousands of bottles of Beaujolais. Today, they offer guests a good night’s rest and a great story to tell friends. Rather than being destroyed, the four casks were salvaged and transported from France to Holland where they now have a second life as modest, self-contained accommodations for travelers (and their pets). The giant barrels house sleeping space for two people and a sitting room. Private bathrooms are attached. From there it’s a long but adventurous hop to Inner Mongolia. Deep in the heart of the Gobi Desert is Three Camel Lodge, an eco-resort that is equally devoted to environmental and cultural preservation. 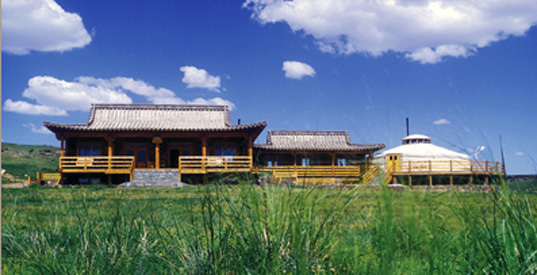 Guests stay in traditional Mongolian gers or yurts. Besides supporting efforts to preserve the population of indigenous Gobi flora and fauna, the Lodge recycles organic waste for use as fertilizer at local farms and work with local farmers to raise chickens, pigs, and livestock. They also launched a “No Plastics in the Gobi” program, working with locals and small businesses to encourage the use of cloth bags. 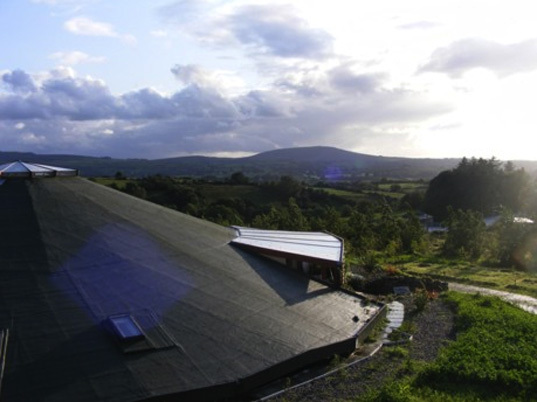 Straight from Middle Earth, the Gyreum Ecolodge is the first lodge in Europe to be awarded the EU Eco Label and a recent finalist for the LAMA Awards as the Best Ecofriendly Building. This 100 ft diameter solar and wind powered circular fort is half buried in the County Sligo earth and constructed from renewable resources. Did we mention that it’s also aligned to three solar events and points towards surrounding megalithic cairns? Accommodations are simple but perfectly adequate. Hobbits not included. 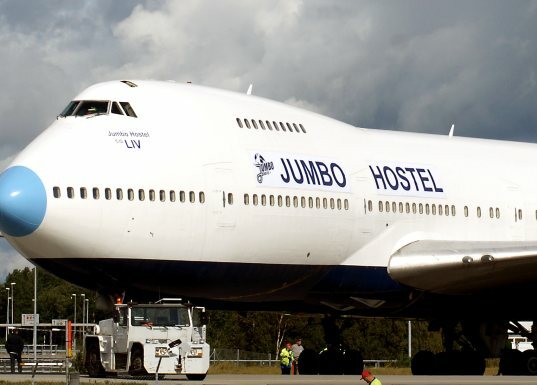 We head a bit farther north to visit the Jumbo Hostel, an eco-hostel that soars to the top of our list this summer. This 747-200 logged countless miles during its years of service but an early retirement to the landfill is not in the stars (or skies) for this particular plane. 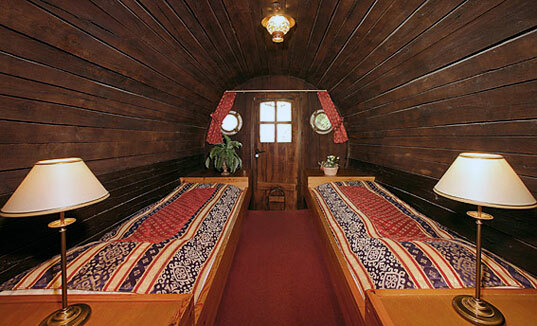 The jet now houses weary travelers in compact 6 square meter rooms. Some lucky visitors may even get to sleep in the cockpit, and soon more rooms will be added to the mechanical part of the plane. The interiors are decorated in simple and modern Scandinavian style and still feature the original lounge and first class seating. An honorary mention goes to one of the best not-yet-built eco-hotels, the Oil Rig Platform Resort and Spa designed by Morris Architects for the Radical Innovation in Hospitality Design Competition. This smart design would take the oil rig, one of the most recognizable icons of dirty energy, and re-invent it as an eco-haven powered by completely renewable energy sources. The Urban Cactus is a residential project in the Netherlands that will offer 98 residential units on 19 floors. Thanks to the staggered design of the curvy balconies, each unit's outdoor space will get plenty of light from the sun. That means that this greenscraper really will be green when all the residents' gardens are in bloom. While this tower may lack in the technology department, its carbon-mitigation potential still looms high thanks to all the photosynthesis happening on the porch. Plus, its white color will help to mitigate the urban heat island effect. When 340 on the Park opens later this year in Chicago, it may become the first residential greenscraper in the city to meet LEED standards. The building is sure to be a wealthy EcoGeek's dream-come-true. If you have $700K to throw down on a 1600 square-foot condo, you can enjoy low utility bills thanks to the building's fully insulated windows and rainwater capture system. And the most awesome amenity is the multi-storey winter garden starting on floor 25. On the other side of the pond, the Waugh Thistleton Architects have an eco-residential building in the works as well. This design will employ helical wind turbine technology previously on featured on EcoGeek. Four turbines attached to one side of the tower have the potential to generate 40,000kW hrs a year, more than 15% of its energy needs. If this 68-story super greenscraper becomes a reality, it may become the tallest of all eco-towers, thanks to the proposed 200-foot wind turbine that will sit atop the building. Burj al-Taqa will occupy #22 on the world's tallest buildings list should it gets the green light. Wind isn't this greenscaper's only bag, however. Solar panels will cover a 161,459 square foot artificial island chain connected to the building and seawater will power Burj al-Taqa's air conditioner! The Hearst Tower became New York City's first skyscraper to achieve LEED Gold accreditation from the USGBC when it opened its doors last year. 80% of the steel used to make the behemoth was recycled. On the inside, the floors and ceiling tiles are made from recycled materials as well. The diamond shapes on the building's faÃ§ade aren't just for show either. The diagonal grid required fewer steel beams to achieve the same rigidity as a conventional skyscraper, and the design allows more natural light to enter the tower. What's more, rainwater is collected on the roof and is funneled into a 14,000-gallon tank in the basement. The Hearst gathers enough water from the sky to account for 50% of the tower's usage. It's pumped into the cooling system, used for irrigating plants and for the innovative water sculpture in the main lobby. Formerly on featured on EcoGeek, the CIS Tower outdoes the pretty much anyone in solar. Weighing in with over 7,000 panels on the faÃ§ade and 24 wind turbines on the roof, the CIS Tower will be able to produce 10% of its energy needs all on its own. The Dubai International Financial Centre Lighthouse Tower plans to use 4000 photovoltaic panels on the south facing faÃ§ade as well as three mega 225 kilowatt wind turbines to meet its electricity needs. Other details are sparse, if it was under construction this definitely would have broken into the top three. The designers of Bank of America Tower, Cook + Fox Architects, are hoping to one-up the Hearst Tower by going for LEED Platinum certification. We'll see if they pull it off next year, when the building is slated to cut the red ribbon. Like the Hearst, The BOA tower will also use rainwater capture and floor-to-ceiling windows for natural lightingâ€”but it will also employ even more EcoGeeky technologies. Natural gas fuel cells will create on-site electricity, and sunlight-sensing LED lights will maximize efficiency. Another greenscraper designed to harness winds at lofty heights, the Pearl River Tower will use internal wind turbines to keep the lights on. Fashioned like a giant wing, the tower pushes air through wind tunnels on two of the building's 71 stories. This eco-marvel of a building will also employ geothermal heat sinks, ventilated facades, waterless urinals, integrated photovoltaics and daylight responsive controls when it opens in late 2009. Three 96-foot propellers suspended between the towers will supply the 42-storey spires with over 1100 megawatts per year. The shape of the building itself will create an accelerated airflow for the jumbo blades. Here are some virtual views of the Arabian Gulf from various levels of the building. Real views can be appreciated later this year, when the building opens. 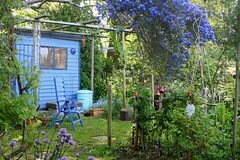 With global warming staring us in the face, it’s about time we all did our little bit to make our homes eco-friendly. We’re not talking lifestyle-altering changes here, but just small measures, which if added up, can make a world of a difference; and more importantly, a difference to our world. Buying energy-efficient appliances is one of the most effective ways of saving energy. What’s more they are easily available and are not necessarily more expensive. New, energy saving bulbs consume as much as five times less energy as that used by older bulbs. Just replacing the bulbs in your house would be a small step for you, but literally a big step for mankind. A typical home loses almost half its heat through its walls and roof. Insulating the roof and the walls could save you almost £400 in energy costs annually, which more than makes up for the relatively low initial cost of insulation. Switching off an electronic appliance with a remote control merely puts it on standby and energy is still being used. Any appliance that is not in use should be put off at the power switch. This small act could save each household about £38 a year. Consider how much that translates to per neighborhood! Why not try using a plug in power meterto measure exactly how much electricity each household appliance consumes? Installing an energy-efficient heating system in your house could reduce your energy consumption by 40 percent. Replace your old boiler with a more advanced model, which is designed to save energy. Radiators lose a lot of heat from their rear. Placing reflective foil panels behind all radiators can help harness and use this heat. Foil panels are easily and cheaply available at most DIY stores. While washing clothes in a washing machine you could save a lot of energy by running the machine with a full load and at a slightly lower temperature. As far as possible put your clothes outdoors to dry and avoid using the tumble dryer. When boiling water in a kettle, boil only as much as you need. Boiling extra water is a waste of energy as well as time. If you use your kettle a lot, you may want to consider buying an eco kettle. A smart electricity monitor is a clever little device that can break down the energy consumption of every appliance in the house and can give you your energy usage in real-time. Use it to help you ascertain which appliances are consuming too much energy and where you can cut down. Turning down your thermostat just one degree can make a big difference to your total energy consumption while still keeping you comfortably warm. Consider installing solar panels to create your own energy. One solar thermal can provide an astounding 50% of your annual hot water requirements. Mini home wind turbines are brilliant if you live in the open countryside. There are a range of portable solar chargers available that can be used around the house and in the garden to charge mobiles, mp3 players, etc. #1> Learn Read up about carbon emissions and the environmental impact of the choices you make--big and small--in living, eating, and transportation. Use a carbon footprint calculator. Here's are some websites you can check out if want to learn more: ACT on CO2, 10:10 UK, and Earth Hour. #2> Save energy. Saving energy is all about conserving (using less) and being more efficient (using what you use better). You can conserve energy by turning off the lights when you're not in the room. You can be more efficient by buying compact-fluorescent light bulbs (CFLs) that create the same amount of light with less energy. The same principle applies to the big stuff, too. The Energystar website provides lots of good information for household energy efficiency. #3> Reuse and Recycle When you buy things, purchase items with less packaging or packaging that can be recycled. If you are lucky enough to have curbside recycling, use it--otherwise, learn where the nearest recycling center is and make a habit of taking your recyclables there--to make it even easier, talk to your neighbors about combining trips. #4> Drive Less Drive less and save more. Plan ahead to combine trips. If you live somewhere that public transportation is an option, give it a try. #5> Enlist Help Reach out to family, friends, and co-workers. Reducing our carbon footprint is a community effort. Talk with other members of your household about how to reduce your emissions. Talk with your friends about ways to share resources. If you are a member of an organization--a church or civic organization--discuss ways it can save money on energy bills and other non-renewable resources it uses. #6> Eat less meat. Eating less meat is both good for you and for the planet. Switching to a plant based diet for even one day a week will make a difference. If you need some helping getting started, here a helpful guide. #7> Grow your own fruits and vegetables. When you grown your own food you'll enjoy fresh, high quality food. You can also grow varieties you won't find in a supermarket and you'll know exactly what the food has or has not been exposed to. There are many guides on how to grown your own fruits and vegetables. You can start small, team up with your neighbors, or--for city dwellers--even start with a view potted herbs. Growing food in your own neighborhood cuts carbon emissions considerably compared to food shipped hundreds or thousands of miles to your door. #8> Buy local food. Join a CSA (Community Supported Agriculture) and shop at farmer's markets. Planes get a respectable 43 passenger miles per gallon (pMPG), but they cause 1.9 times as much climate change per gallon of fuel burned, by virtue of their being up in the sky. So when we consider climate change, the plane's efficiency is more like 22.6 pMPG. That's worse than most cars. And if there are two people traveling in the car instead of flying, then the pMPG of the car is doubled, while the plane is stuck at 22.6 pMPG, because we're already figured the plane's pMPG on a per-seat basis. The only time that flying is better than driving for a given trip is if there's only one person in the car, and/or we're assuming a very low-mileage car. If may be unavoidable to fly sometimes, but if you're considering you next vacation option, you might think twice and decide for the spot that is driving distance away. #10> Kick the plastic habit: bottles and bags. I'm going to finish with one of the easier ones. Stop buying bottled water and start taking your own bags to the store. Plastic water bottles are really bad for the environment. There are many alternatives. Plastic bags are equally bad for the environment. Make it a habit to use reusable bags. The Environmental Performance Index (EPI) is a method of measuring the performance of national governments related to environmental policies. Yale University and Columbia University release the EPI every year during the World Economic Forum, ranking 163 countries according to 25 indicators. The final mark shows how close the country is to accomplish the environmental goals. Here are the top ten countries on the list which have made most, officially the greenest in the world. Iceland is considered to be one of the world’s most beautiful countries because of the breathtaking nature, but they can still enjoy that due to the high level of accomplishing the environmental policy goals. People in Iceland use the geothermal energy very well, while the most used electricity and heat source is the hydrogen. Believe it or not, amazing 82% of the electricity and heat in Iceland comes from hydrogen and geothermal sources, while only 18% comes from coal. The first place is well deserved. Switzerland was leading the EPI list years ago, but now has fallen to the second place just due to incredible Iceland performance. However, Swiss are still working hard for creating greener society. The government has imposed a fee for disposing thrash in the country, but the people are pretty interested for ecology as well. For example, there are cities, smaller towns actually, in which using car is prohibited. That’s how Switzerland remains on the top of this list for years. Costa Rica government is strongly committed to following the Icelandic example for use of renewable energy sources. They have set a goal to become carbon neutral until 2021! The land suffered deforestation for years in order to be made space for agriculture, but now one of the main goals is reforestation of the country, planting over five million trees over last five years. One of the first things when visiting Stockholm, Sweden, is noticing the wide range of eco-friendly products. Nevertheless, the most important thing that put them so high on the EPI list is the fact that they are in advanced phase of the implementation of the plan for phasing out the fossil fuel by 2020. Swedish government also is trying hard to use the forests very well, as the sawdust of the lumber is used for generating heat. These are just some of the indicators that make Sweden on of the greenest on the world, but explaining all of them would take a lot of space. Norway already feels the consequences of the global warming, as its north parts are close to the melting Arctic, so they’re taking a lot of measure to prevent any possible catastrophic scenario. Norway government and the people as well, are making efforts to become carbon neutral until 2030, although it is an oil export oriented country. They plan to make diesel fuel more expensive than the eco fuels and stimulate people to use the second ones. Maybe you will be surprised of the fact that one African Prime Minister decide to make his country eco-friendly, but yes, it’s true. Although the little island has very limited resources, they do not give up. Rama Sithanen’s cabinet is trying to find many ways for reuse items through recycling. At this moment they rely on the water that surrounds the island. The indicators that launched France so high on the EPI list are increasing of use of eco fuels, conserving energy, increasing renewable energy rate, increasing of organic farming, etc. In order to stimulate the use of eco friendly energy sources, the government also promoted reduction of taxes for those who use solar panels. However, the most interesting measure toward accomplishing their eco goals is the use of, believe it or not, the straw bales for construction of buildings. Austria has no problems for being green so they decided to go step further. They made a deal with the government of Czech Republic for building eco friendly garden across the border between the two countries. The gardens contain herbs, fruit trees and flowers; they look amazing, though they do not use any pesticides for maintaining it. For the rest of the green country there’s no need to waste words. Cuba has earned the same index as Austria mostly thanks to the decreasing of the use of harmful and illegal pesticides on farms. Allegedly, they try to lower the sea level in order to prevent the salt water ruin the soil. However, their most ambitious project is the use of clear hydroelectricity in the Guama area. The government makes efforts to connect all of the homes in that area to hydroelectric station and provide them all the electricity they need. Should that make success, other projects will follow. We have listed more than 10 ways to help the environment. We couldn't stop adding to the list. If you'd like, send us more ideas. One-third of all traffic is commuters. Use alternative transportation when possible. If you must drive, go slower with proper tire inflation. It saves both fuel and tires, and lowers emissions. It also saves lives. Reusing packaging material saves more energy than recycling. By avoiding extra packaging, you save both energy and landfill space. Yard and kitchen waste (leaves/grass/vegetable scraps) are 30% of trash. Reduce this amount by composting. Also be sure to re-use plastic bags, or better yet... refuse plastic bags when you really don't need them. Don't let faucets run. Never water your lawn at midday. Place a brick in old toilets. Take low flow short showers. Run the dishwasher only when it is full. Let grass grow longer. Plant native or drought-tolerant garden plants. Second-hand smoke is a major indoor air pollutant and health hazard. When you quit, both you and your family will lead longer and healthier lives. Along with nitrogen fertilizer runoff, these are major water pollutants. Domestic cats kill over one billion small birds and animals every year (1 outdoor cat averages 40 kills per year). They upset natural predator/prey balances and eliminate ground nesting birds. Feedlots are a major source of organic pollution. Tropical forests are cut to raise beef. Wearing a sweater in the winter and short sleeves in the summer saves energy and reduces pollution. Don't put batteries, antifreeze, paint, motor oil, or chemicals in the trash. Use proper toxics disposal sites. Never buy more than you need. When relocating or changing jobs try to live close to work. Compare efficiency when purchasing new cars or appliances. Buy fewer things. Choose products with lower energy inputs. Work locally and globally to save natural places, reduce urban sprawl, lower pollution and prevent the destruction of wilderness areas for timber and oil. Take a walk in the woods, or plant trees which store CO2. Teaching our children to love and care for the planet is the most important thing we can do to insure the future of humankind. Wash dishes by hand in a basin, and then use the dish water for outdoor gardens.